My garden greens are plentiful this year. I also decided to put all of my herbs in my garden because the last couple of years they haven't grown overly well in pots. Well, let's just say they runneth over. My oregano, basil, parsley and chives are huge! Honestly, I can't keep up. Anybody need some herbs and lettuce greens? You really can't go wrong with some grilled vegetables and chicken and this dressing made it that much better. I'm serious about the herbs. Call me. 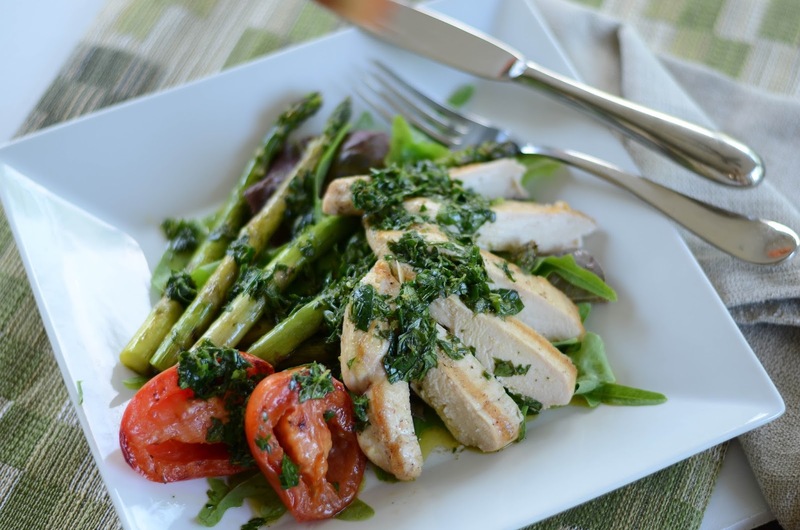 Coat chicken, asparagus and tomatoes with 2 tbsp. olive oil. Generously salt and pepper the chicken breasts. Preheat grill. Grill chicken over medium-low heat for about 10 minutes. While chicken is grilling, clean lettuce greens and set aside. Mix remaining olive oil, vinegar, salt and mustard until cohesive. Fold in herbs and then salt and pepper to taste. You can add more vinegar if necessary. Set aside. Set one side of grill to higher heat. After chicken has cooked for about 10 minutes, turn to finish cooking. Add asparagus and tomatoes to grill with the high heat, turning as necessary. Cook chicken an additional 5-10 minutes or until done. Remove chicken from grill and allow to set for about 10 minutes to lock in the juices. Remove tomatoes about the same time as chicken and then asparagus a few minutes later, or until done.